The undermining of a parents ability to parent"
Please don't miss this important discussion of a topic that will impact the furture of our society! Director for the Center of Families and Children at the Texas Public policy Foundation. Please talk to any current board-member about these positions (described in our by-laws, which you can read here). We will also accept nominations at our April meeting, and will notify members of nominees after that meeting, to be voted on in May. We also have some changes to our by-laws that we will be voting on at our April meeting, so we need members to attend! Texas and negatively impact this boom? The Coppell Republican Club is pleased to announce that decorated war hero and former Congressman Lt. Col. Allen B. West (Ret.) will be speaking at the Club’s meeting on March 19, 2019. Col. West is the author, most recently, of Hold Texas, Hold the Nation: Victory or Death. Texas is booming. In recent years, the Lone Star State has experienced some of the most rapid growth in the country. As more people pour into Texas, some bring with them liberal and socialist ideologies that could swing the state from red to blue politically. West believes Texas is a sustaining force for America, truly embodying the founding principles: those unalienable individual rights of life, liberty, and the pursuit of happiness. It will be principled constitutional conservative policies, not politics as usual, which will secure a sound economic future for America – resulting in growth, opportunity and returning the promise of the American dream for this generation and those to come. Join us at the Coppell Cozby Library and Community Commons on March 19, 2019. Social time and refreshments will begin at 6:30 PM; the meeting will formally start at 7 PM. Col. West’s book, Hold Texas, Hold the Nation: Victory or Death, will be available for purchase and signing. Seating is limited, so please register for this free event at https://www.eventbrite.com/e/lt-col-allen-b-west-to-speak-in-coppell-registration-58173731196. Lt. Col. Allen B. West is the third of four generations of military servicemen in his family. During his 22-year career in the United States Army, Lieutenant Colonel West served in several combat zones and received many honors including a Bronze Star, three Meritorious Service Medals, three Army Commendation Medals, one with Valor device, and a Valorous Unit Award. In 1993 he was named the US Army ROTC Instructor of the Year. He is a Fox News Contributor, Director of the Booker T. Washington Initiative at the Texas Public Policy Foundation, Senior Fellow at the Media Research Center, contributing columnist for Townhall.com, and author of Guardian of the Republic: An American Ronin’s Journey to Family, Faith and Freedom and Hold Texas, Hold the Nation: Victory or Death. He is the former Executive Director of the National Center for Policy Analysis in Dallas, Texas. The mission of the Coppell Republican Club is to create an active social network which promotes conservative values within our community through educating and informing citizens and by giving support and feedback to local, state, and national candidates and officeholders. Its objectives include promoting an informed electorate and supporting and promoting the party objectives and Republican candidates. Tom Giovanetti of the Institute for Policy Innovation provided perspectives on the policy side of this debate, and we also had Hector Tarango, a former Border Patrol agent and security consultant, share his experiences while working along our border with Mexico. Steve Goram, one of our board members. Wilson Powell, a political analyst, spoke about the broader trends in this election. J.J. Koch, elected Dallas County Commissioner, District 2, gave his analysis of the election. The midterm elections resulted in many suprises. It was great to have two speakers who could explain what happened. How not to lose an election – and how to win! In what is guaranteed to be a fascinating evening, we will hear first from Aaron Harris of Direct Action Texas on how elections get stolen through fraud. He spoke to us earlier this year, and many wanted him to come back and hear more about this stain on our political process. The second senate debate between Sen. Ted Cruz and Rep Beto O'Rourke starts at 8PM. Join our debate watch party. This will be a great meeting - you don't want to miss it! With the elections rapidly approaching, now is our opportunity to stop the “blue wave” and KEEP TEXAS RED. To claim victory, constituents need to know their candidates, the candidate platforms, and understand the importance of down ballot voting. In an effort to insure victory, the Coppell Republican Club has joined up with the Irving Republican Women and Coppell Republican Women to host a Republican Candidate Meet and Greet on October 11, 2018 at Hackberry Creek Country Club. Meet and Greet begins at 6:00 PM and the program begins at 6:30 PM. 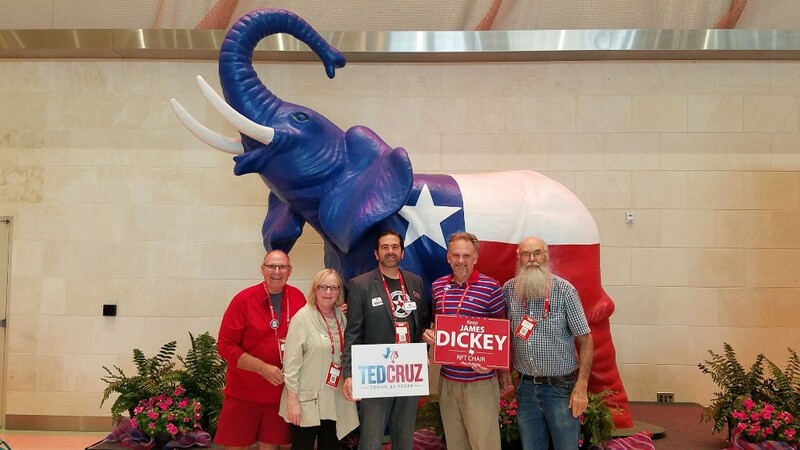 Working with you to KEEP TEXAS RED! September 2018, SREC Committeewoman Susan Fountain came to talk about her work on the State Executive Committee. Please park in designated parking spaces only. Overflow parking may use the Town Center Elementary School parking lot. A light BBQ dinner will be available, so come early. Lathan will talk to us about religious liberty and the rights of small business owners. These are two topics that have been in the news a lot lately. Don't miss this opportunity to learn more about these issues, which are important to all of us. Club meetings are usually held at Ole's Tex Mex restaurant or at the Coppell Public Library depending on the program. The board of the Coppell Republican Club is pleased to have two speakers come talk to us about our party and its relationship to the local muslim community. Come join us for dinner and an undoubtedly fascinating conversation on a topic that affects us nationally...but also locally. and request that everyone attend the Chamber of Commerce Forum. Doors open at 7:30 a.m.; Gavel in begins at 8:15 a.m.
Delegates for the convention were chosen at the precinct conventions earlier this month. However, everyone is welcome to attend the convention. Only the delegates will be able to vote. Enter your first and last name and date of birth and hit "Search". This will take you to your personal information. Under the heading "My Elections" you will find the polling location and sample ballot for both the Democratic and Republican primaries. Immigration: the House and Senate bills on DACA and immigration reform, the good, bad, and ugly. Spending: Government funding runs out January 19th and Democrats are threatening a shutdown. What's the deal on spending and our messaging. In April 2014 Rebekah became the Western Regional Coordinator in Denver for Heritage Action for America. Under Rebekah the Sentinel Program in Colorado alone grew from 30 Sentinels in 2014 to over 500 by the end of 2015. In mid-October she moved to Texas where she assumed the role as Regional Coordinator for North Texas, which boasts near 1,000 Sentinels. Heritage Action Sentinels are a group of committed conservatives doing the hard work of Congressional accountability. Just a reminder to pay your annual dues for 2018! During our membership drive in January and February, we will have drawings for a giftcard at our meetings to show our appreciation to our great members who support our efforts to educate the community on conservative issues. Pay Dues from link at bottom of home page. We will provide appetizers, desserts and iced tea! Coppell Republican Club Christmas Party will be December 12th. How can Dallas County help Texas enact pro-taxpayer reform? 2. Who’s holding back Reform? 3. Why Dallas County Matters. For nearly a decade, Ross has been active in grassroots organizing, political campaigns, journalism, and as a resource for taxpayers looking to hold state and local officials accountable. He regularly speaks to freedom-loving Texans regarding the need for tax and spending reform, government transparency and ethics, and the crucial importance of civic engagement. Ross is the Vice President of Local Affairs and Metroplex Bureau Chief for Empower Texans. Ross has a degree in Economics from Arizona State University, with a special emphasis on Public Policy and U.S. Constitutional history. Come join us. Connect with fellow club members and meet new people who want to learn about the club. Editor of "Must Read Texas"
Matt provided insight to what had gone on in the previous legislative session and some ideas about what might happen in the upcoming special session. He also made some comments on national politics. Matt also answered questions from the audience. Matt was recently voted in as Chairman of the Travis County Republican Party. Come hear this important commentator and leader in state Republican politics comment on the following topics. 2. Review of the past Texas legislative session. 3. Preview of the Texas special session. 4. If time permits, there will be a question and answer period. Matt Mackowiak is an Austin, TX and Washington, DC-based political and communications consultant and the founder and President of Potomac Strategy Group, LLC, providing political consulting, media relations and crisis communications assistance to campaigns, companies, groups and individuals. Over his career Matt has developed deep relationships with national, state and local media and political figures. at the Coppell Public Library. The Club also held an election of officers. The April 27th meeting was held at the Coppell Public Library. to their original birth certificate when they turned 18. She said that SB 329 / HB 547 would do that, and asked that we support the bills. Candidates for Coppell City Council and CISD Board of Trustees were invited to attend. Mark Hill and Maggie Lucas competing for the only contested City council race spoke. Johnny Lopez, election judge, gave a report on early voting turnout. All the candidates for Coppell City Council and CISD Board of Trustees were invited. Elected officials and those running for office were recognized. Four city council positions are up for election. Running unopposed, Cliff Long Place 1, Wes Mays Place 3, and Nancy Yingling Place 5. Ms. Yingling was not able to attend. Mark Hill and Maggie Lucas are competing for City Council place 7. Ms. Lucas had a conflict and was unable to attend. Cliff Long, Wes Mays and Mark Hill made presentations and then answered questions from the club. State Representative Matt Rinaldi, gave the club an update on the legislative session in Austin. Four CISD Board of Trustees positions are up for Election. Thom Hulme and Ron Hansen are competing for Place 4. David Caviness and Vara Kuppam are competing for Place 5. Thom Hulme was not able to attend. Vara Kuppam, David Caviness and Ron Hansen made presentations and then answered question from the club. speak at our February 23rd meeting. Mr. Snipes, after graduating from West Point, served many years as an armor officer. He was selected for the Army’s Legal Education Program and earned a law degree from the University of Texas. He then served another six years in the Army working in several legal areas. Mr. Snipes has also worked in private practice and as a federal prosecutor, judge, and law professor before joining the Dallas County District Attorney’s office. Mr. Snipes comments were enthusiastically presented covering stories of military and legal criminal prosecution and defense assignments. He assured the members that Dallas is not as sanctuary city. Mr. Snipes talk was followed by a question and answer session. We hope that Dallas County DA Faith Johnson, originally scheduled for the February meeting, will be able to speak to the club at a future meeting. Senator Huffines had planned to attend but had a conflict with a Senate committee meeting. The meeting was a great success with a standing room only crowd. Rep. Rinaldi, Rep. Simmons and Ms. Gniffke spoke about legislation that was being considered by the legislature. A large number of those attending then made comments and asked questions.